Dublin in 2012 is not London in 2012, nor is it Dublin in 2002. In both of the later cases, someone in search of a bottle of wine could stroll off the main thoroughfare in the city centre and step into a treasure trove of old English luxury, a shop whose wooden shelves are stocked full of bottles of fine claret and where the terms good and ordinary are conferred as a mark of quality. The store I speak of is Berry Bros. & Rudd, at one time my favourite wine store in Dublin, and a great place to browse and while away 15 minutes of a Saturday afternoon. Yes, on St. James St. in London, you could precede the wine shopping with breakfast at The Wolseley, pick up an umbrella in Swaine Adeney Brigg or a cigar in Fox’s. The similarities between London and Dublin are not to be sniffed at, as should one wish to engage in similar pursuits in Dublin, there are plenty of options around Harry St., although thankfully there has never been a caviar and champagne bar on the corner (to the best of my knowledge anyway). Alas, it is now in 2012 Dublin and the Berry Bros. & Rudd shop is no more (probably because people were, like me, doing more browsing than buying). It has been replaced by a rather curious clothing store that purports to be outfitters to the gentry – by gentry, they must mean students at Hogwarts though, because my cursory glance in the window revealed schemes and patterns which appear to be inspired by the house colours of Gryffindor, Slytherin, Ravenclaw and Hufflepuff. You are probably wondering at this stage why I’m going on about Berry Bros. & Rudd. 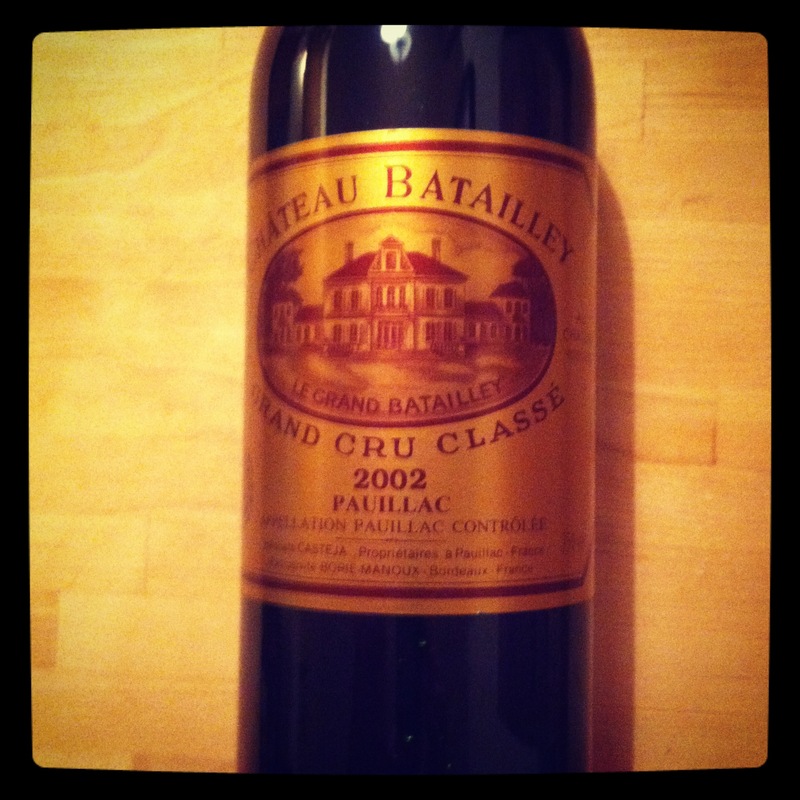 Well, the reason is that at a tasting at the Berry Bros. store on Harry St., I was introduced to the wine of Château Batailley, reportedly one of the better value Bordeaux classed growths around. Indeed, this 5eme cru classé was portrayed to me as a great example of what one should expect from the wines of Pauillac and essentially, a very decent bottle of claret. While the 2002 vintage was not stellar by any stretch of the imagination, Jancis Robinson described it in 2004 as being “the most keenly priced for many a year” and that “the 2001 and 2002 vintages provide an opportunity for anyone thinking of starting a Bordeaux cellar”. I know that when Jancis makes such pronouncements she is really referring to wines way out of my price range but given that I like Ch. Batailley, I decided to pick up a few bottles of the 2002 vintage to stash away. The second reason I mention the Berry Bros. shop on Harry St. is that ostensibly it was an unfortunate casualty of the economic downturn in Ireland. There are very few positives of such a downturn but undoubtedly one of them is that it is now reasonably affordable to eat out in Dublin and last Saturday, I visited Rigby’s Deli and Dining Room on Leeson St. Despite only being open for a short time, Rigby’s was recently listed in the Sunday Business Post’s 2011 wine awards. And why shouldn’t it be, because after all, I designed the wine list there. You did too actually, as did the guy in the corner with his bottle of New Zealand Pinot Noir as did the girl near the door with the bottle of Chilean Sauvignon Blanc – we all created it because Rigby’s is BYO (Bring Your Own) with no corkage charged. The food menu in Rigby’s is also nonexistent, with the two starter and two main course options (meat or fish in both cases) explained to diners by the waiters. Dishes change each day based on the produce available. I knew in advance, thanks to twitter, that the menu last Saturday would be inspired by French classics, so I thought this would be a good occasion to break out a bottle of the Ch. Batailley. I was a bit concerned because I had opened a couple of bottles two years ago and found them to be fairly muted on the nose and extremely rough around the edges. Thankfully, I wasn’t disappointed on this occasion. Even though it wasn’t decanted, the 2002 was much rounder than on my previous tasting with lots of nice cassis, plum and cigar box cedar notes and a long finish. Incidentally, does anyone have any tips on how to decant wines for BYO restaurants; maybe decant at home first and then re-bottle in a clean screwcap? Any tips on this would be most appreciated. The Ch. Batailley went down extremely well with the duck a l’orange and I would say it is now beginning to show glimpses to suggest that it is entering its optimum drinking window. Two courses in Rigby’s are keenly priced at €21 and clearly reduced prices do not have to mean reduced quality because the food in Rigby’s is of a very high standard. In light of this and the BYO policy, this is a great opportunity for people to crack out a nice bottle of wine and enjoy it in a restaurant setting. I paid €30 for my Ch. Batailley when I bought it a few years ago, and if I had bought them off a restaurant wine list, I’d probably have to pay €75. So it’s a thumbs-up from me for both the wine and the venue! P.S. Although the public store is now closed Berry Bros. & Rudd have still retained an Irish office to manage online orders from Ireland.